You even get a carrying/storage case for your mat. Whether you are too stressed to sleep or suffering from muscular pain, it’s horrible to suffer and just lay waiting for your meds or morning to kick in. However, I was recently introduced to a helpful product through this review and giveaway called the Spoonk Acupressure Mat that works by stimulating those targeted painful spots on your nervous system much like the pressure of fingers to bring on relief through acupressure. There is a lot of help in this Spoonk mat. This mat is made of all natural materials in the USA from CertiPur-US ECO foam that is non-toxic as well as fire resistant with stimulation points out of ABS and hemp plastic. The company was gracious enough to send me two of their regular size mats and a groove ball for this review for myself and my mother to try for own unique issues. Here's what the stimulation points look like close up. Doubters may think that acupressure can’t possibly be effective, but I firmly believe in the difference it can make. I have used Bonnie’s Prudden’s method of acupressure for erasing muscles that have gone into spasms to become trigger points ever since I had a TMJ problem to get rid of pain, which it does quite well. The Spoonk mat has 6210 acupressure stimulation points that once you lay down help increase circulation enough to relax tight muscles and lessen pain. You can’t press a sore bone forcefully against this mat, the Spoonk needs to work through the padding that makes the skin to reach those points. Spoonk mats come in a variety of colors! I’m going to tell you something funny about the first time we used our Spoonk mats. After we finished photographing the products, I unrolled those mats out for us to test. My mother decided she was just going to start laying on hers while I was putting the camera and things away. All of a sudden, she commented how her back area was starting to feel wonderfully warm. She kept repeating how soothing the warmth felt for her arthritis compared to rubbing with a pain cream. Anyway, I hear her tell me to hurry and come try this, but I said that I will get there as soon as I finish with my task. The next thing I knew, I was hearing snoring. My mother fell asleep on the Spoonk within no more than twenty minutes! When I tried the Spoonk, I didn’t feel the heat as soon as my mother did. Instead, I felt a slight tingling initially and then a few minutes later, and I understood what she meant by that wonderful warmth from laying on top of those stimulation points. It really did ease a stiff back and relax not just sore muscles, but the body and mind as a whole. Spoonk Grove Ball is good help for hands or feet. 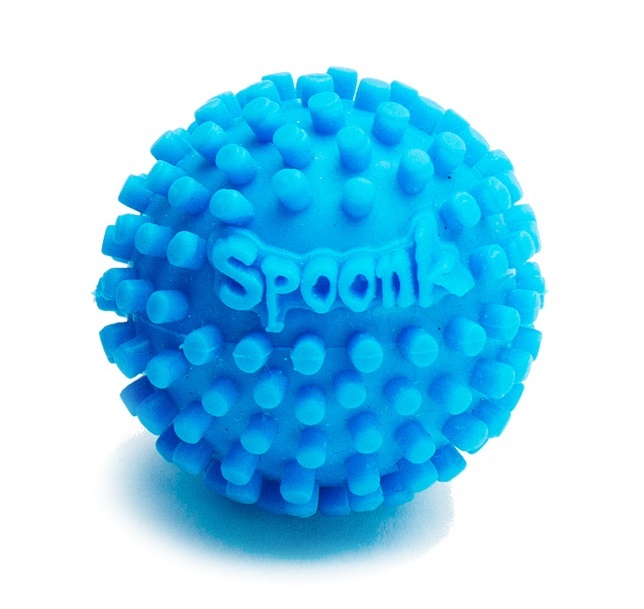 We also got a Spoonk groove ball that has those stimulation points all over it like a man-made blue porcupine. These points are sharp but are soft once your body is positioned against them like the mat, but target pain better than you may ever believe. My mother has arthritis in her hands and squeezing that ball was so much more comforting than another squeeze ball that her doctor recommended. Spoonk Grove Ball really does better than the smooth squeeze balls. You are advised to use the Spoonk for as little as five minutes if you want to recharge your tired body for some extra energy during your day. Those times when you’re under a lot of stress or the pain starts to kick in, a 25 minute break can help since those stimulation points can release happy endorphins. Before bed, try 35-45 minutes to bring on deeper sleep. Anyone can use the Spoonk, but if you’re pregnant, have high blood pressure, take blood thinners, have a heart problem or sensitive skin, you may want to check with your physician first before using. With deepest sincerity, if you hurt or under stress, feel exhausted, I can’t tell you how much we love the Spoonk mat. With Mother’s Day’s almost here and Father’s Day just around the corner, you couldn’t give a more helpful gift to mother, dad as well as yourself than Spoonk. Once you try this yourself, you will be a believer too. This I am certain. a Spoonk combo mat set of a large size mat, a travel mat, carrying bag, and a groove ball ($86.98 total value)! Hi! 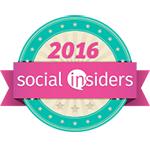 Mary here, just another friendly beauty crazed blogger and self-confessed perfumista. I consider myself far from glamorous, which is why I can’t resist experimenting with great products. My goal is to share and inspire so even the average woman like me feels better about herself from her appearance to her daily life with the help of my product discoveries, tips, style, favorite recipes, healthy living, household solutions, and more. If I can just help improve one life, then I know that I am on the right track. Take care and thanks for stopping by. If you like what you see and want your client or your own product (full size only) to be considered for a review and/or host your giveaway on Beauty Cooks Kisses, then contact Mary at nuts4stuff@gmail.com for more information. Thank you.